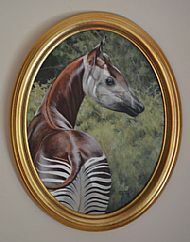 Okapis are a most unusual animal, looking like a combination of several put together. These quiet, timid animals are very rare and from the forests of central Africa. They are a close relative of the giraffe, having a similar long neck and long blue tongue. The inspiration for this painting is the way the light creates a two-tone colour on their wonderful velvetty coats. Capturing this was quite a challenge. Also the characteristicly striped hindquarters proved quite fascinating, getting the stripes to wrap around the quarters. This was painted on an oval canvas as I thought that the composition just fitted that shape, allowing the eye to travel along the tail, back, neck and then down to the face. A rare and beautiful animal captured in an unusual way, creating a stunning painting.